I made the handwriting animations with a drawing program. First the individual images are made in layers and then the images are animated with an animation program. The letters for the animations, in the ZB style—a style that is similar to Zaner Bloser, are hand drawn, which means I didn't use a font for the animated blue letter, instead, I drew over the dotted font background with a semi-transparent brush. 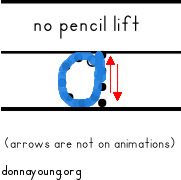 View the animations online from donnayoung.org. If you must have them on your computer for off-line viewing, they are included on the Site CD, YoungMinds once the set is complete. If you want to view my animations on your computer off-line, purchase the Site CD, YoungMinds.